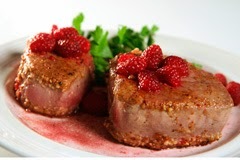 * Serve this Almond Encrusted Tuna with baby salad greens, rice and a glass of Estancia Pinot Noir. Marinate tuna steaks for 1 hour in Estancia Pinot Noir. Fine chop 1 1/2 cups of almonds and pepper flakes in coffee grinder or kitchen aid mixer, combine with corn starch on flat plate. Remove steaks from wine, let drain on paper towel. Coat well both broad sides of each steak with almond breading mix, let set 5 minutes. Lower heat to medium, deglaze pan with Estancia Pinot Noir, reduce wine by 2/3, add raspberries. Remove from heat, add butter and remainder of nuts, serve around tuna on plate or platter.